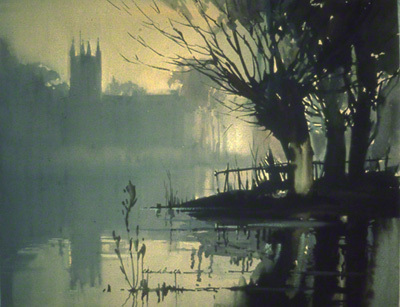 A Water colour painting depicting a misty river scene by Claude Buckle. The picture is dark and gloomy and painted almost in monotone colour. This painting style was much favoured by the artist. This style uses a single colour theme and much subtlety to obtain the right effect. Created in 1968.